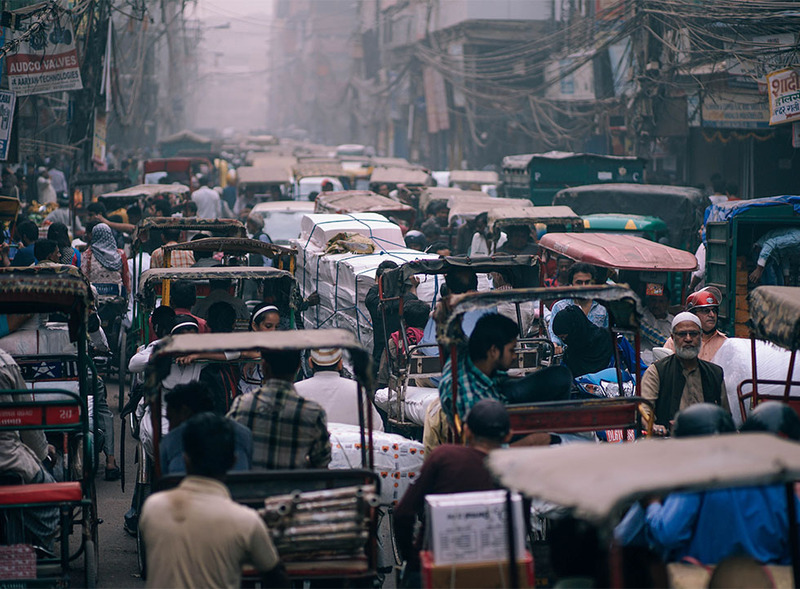 As the world grapples with the escalating effects of the financial crisis, Global Footprint Network reported on another mounting—and unsecured—debt: a growing gap in India between the amount of natural resources the country uses and how much it has. India now demands the biocapacity of two Indias to provide for its consumption and absorb its wastes, according to a report released by Global Footprint Network and CII (Confederation of Indian Industry). 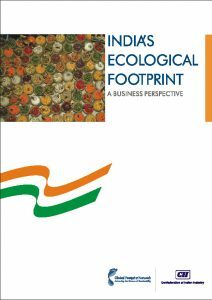 The report, India’s Ecological Footprint: A Business Perspective, was presented Monday in New Delhi to a conference that included top Indian environmental officials, leaders of Indian industry, U.S. State Department representatives and other stakeholders. India’s Ecological Footprint—the amount of productive land and sea area required to produce the resources it consumes and absorb its waste—has doubled since 1961, according to the report. Today, the country’s total demand on biocapacity is exceeded only by the United States and China. Since 1961, India’s GDP has nearly tripled, going from $177 in constant US dollars to $512. Over that same period, however, the Ecological Footprint of the average individual in India has actually declined by 12 percent. 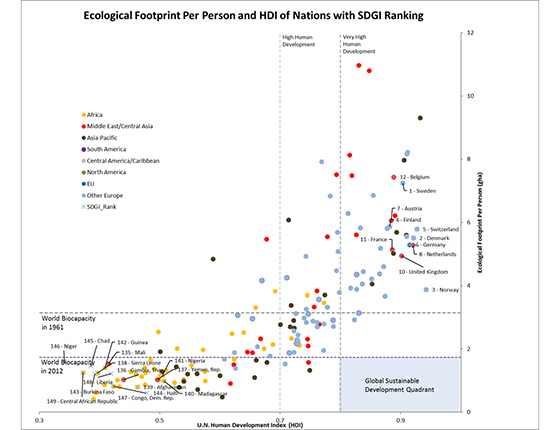 This is a trend that runs counter to that seen in many industrializing Asian nations where Footprint has increased as GDP increases. It suggests that while some citizens are enjoying a higher standard of living, the majority of Indians are not benefiting from this wealth. Rather, poverty is growing as an increasing number of people compete for a limited pool of resources. 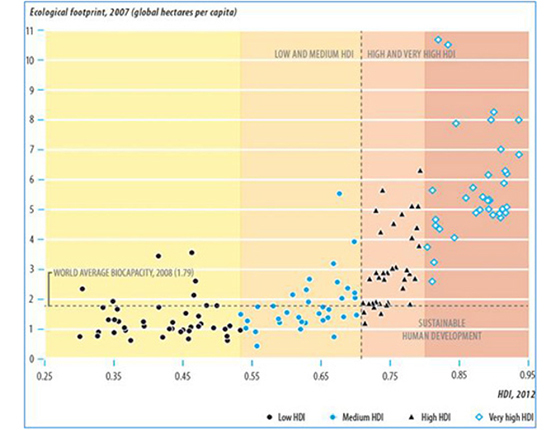 While India as a whole demands a significant percent of the world’s biocapacity, its per-capita Ecological Footprint, 0.8 global hectares, is smaller than that in many other countries, and well below the world average of 2.2 global hectares. 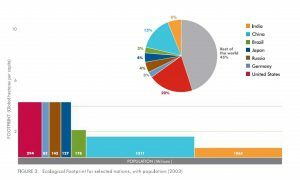 Indeed, the Ecological Footprint of many Indians may need to increase to allow for sufficient food, shelter, electricity, sanitation, medicine and material goods. 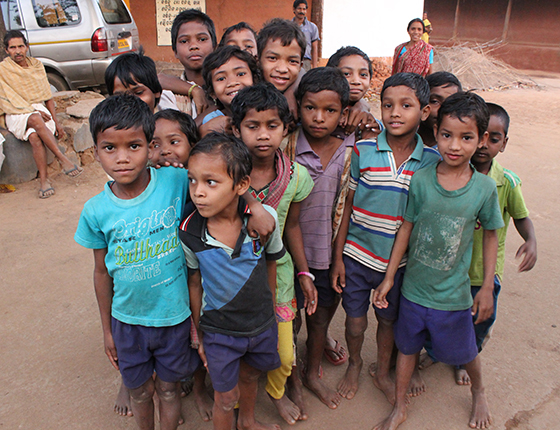 At the same time, the United Nations projects that India’s population will reach 1.7 billion by 2050. 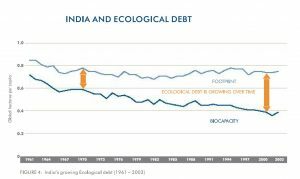 If this is the case, India is likely to face a widening ecological deficit even if current per-capita levels of resource consumption remain the same. India also has the largest total water footprint of any country in the world. This is essentially due to the size of its population, as its water use per capita is less than that in many countries with similar or higher incomes. In addition, 40 years after the Green Revolution, many experts argue that India’s population is growing faster than its ability to produce staples such as wheat and rice. Some attribute the lag to the fact that irrigation and agricultural research has not expanded since the 1980s, but groundwater has also been depleted at an alarming rate. In Punjab, for example, more than 75 percent of districts extract more groundwater than is replenished by nature. To maintain a robust economy and good quality of life, the report states, Indian businesses and government must invest in areas such as women’s health and education to reduce family size, resource-efficient cities and infrastructure, and increased food system productivity. Significant efforts in the business sector are already underway in the areas of alternative power, green building, low-emission vehicles and energy-efficient manufacturing. India is poised to play a major role in the large-scale commercialization of renewable energy technologies and can offer technology transfer to other industrializing nations. The country has achieved installation of over 10,000 megawatts of renewable-based capacity. It is fourth worldwide in terms of wind power installed capacity. More than 95 percent of the total investments in renewable energy in India have come from the private sector. Indian industry has also established ambitious targets for low-Footprint construction, with Indian Green Building Council having set a goal of achieving one billion square feet of green building space by 2012. Clearly, India’s current ecological deficit poses a clear challenge to its leaders’ ability to improve the quality of life for vast segments of the population now living in poverty. For India as a society to continue to prosper in an increasingly resource-constrained world, business and government leaders must work actively to protect the natural capital on which India’s economy, and all human life, depends. With policies and business practices that value and protect the country’s natural capital, India can shift from an economy that has grown at the expense of the environment to one that flourishes by preserving it.